I hope that everyone had a great Labor Day Weekend! Whether you've just started classes, began teaching this week, or just straight up need a serious detox from partying (like myself), this post is for you. LUSH Cosmetics Honey I Washed the Kids soap bar will be the most delightful cleanser to ever touch your hands and body, and you totes deserve it. Treat yo'self. Honey I Washed the Kids description from LushUSA.com: "Best-selling honey toffee soap-sation; Honey I Washed the Kids is one of our best-selling soaps because it’s simply irresistible. People who fully intended to walk past a LUSH shop find themselves unable to resist its sweet caramel fragrance. You’ll inhale, drool, pick up a big chunk and immediately want to wash yourself all over with it. It’s so gentle, buttery and scrumptious you’ll have a hard time keeping it to yourself. The honey water and aloe are so softening and moisturizing, you can use our toffee-scented sensation on the whole family." If there's anything I love so damn much about LUSH, it's that their stores and products have the most beautiful, natural fragrance - contrary to scented, manufactured products. So when I say I'm obsessed with Sympathy for the Skin hand & body lotion because it smells of vanilla and banana pie, I'm not talking about that artificial banana whiff you'd get from a Bath & Body Works moisturizer. Kinda like the fact that blue Jolly Ranchers taste waaay different than blueberries, and the flavor of cherry Blow Pops aren't even close to the taste of a real cherry. LUSH Cosmetics Honey I Washed the Kids soap is the epitome of this factor, simply because , well, LUSH is the real deal. It has the most unique, sweet toffee + honey fragrance that you have to see [or smell] for yourself to believe. And who wouldn't wanna bathe in that?! 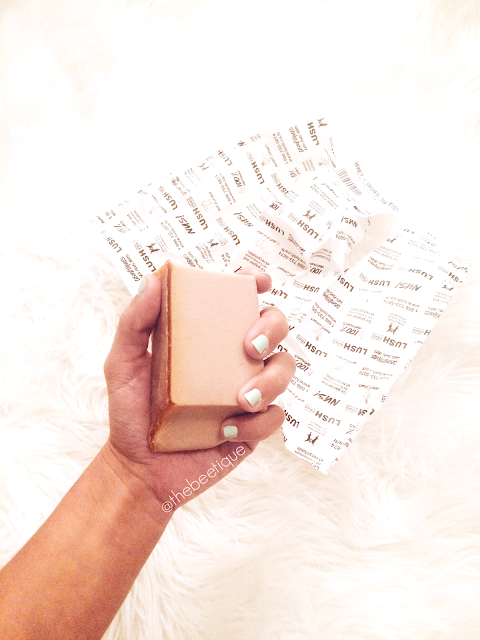 My review :: I have absolutely no complaints about this fabulous soap, besides the fact that sudsing with a bar could be a bit of an adjustment to those who prefer liquid body wash (me, prior to LUSH addiction). Just like the rest of LUSH's products, a little goes a long way. HIWTK gives you that clean feeling and doesn't leave a slippery layer on your skin. Sold. What I do :: I rub my Honey I Washed the Kids bar in a circular motion directly on my skin in the shower. Once I feel that I've covered enough area, I put the bar down, then buff in the layer on my skin with my hands. You can alternatively use a loofah or washcloth for this step, but remember, soap bars don't lather as well as liquid body wash. Oh, and this bar works just as great as a hand soap, too - call that ish #HoneyIWashedMyHands. Once you've towel or air dried, don't forget to moisturize. LUSH's Dream Cream + Sympathy for the Skin hand & body lotions are my fav. You can grab Honey I Washed the Kids soap, 3.5 oz., for $7.95 here. Don't forget to check out my other LUSH Cosmetics reviews! 3 comments on "LUSH » Honey I Washed the Kids Soap Review"